The diagram shows a circle centre O with points P, Q, R and S on the circumference. UST is a tangent to the circle. 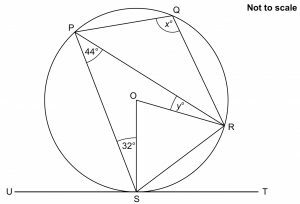 Angle RPS = 44º and angle PSO = 32º. Find angles xº and yº.